Several years ago, we had the chance to visit a crocodile farm in Queensland, Australia. There were several highlights, not least the chance for the children to hold a crocodile – a very small one, of course, with its jaws taped shut. Even with one that small, the frisson of terror remained and the children all laughed nervously for the camera. We noticed as we walked round the farm that many of the crocodiles had signs on their enclosure saying where they had been captured, and telling a story about where and why they had been caught. This was where we discovered an additional use for a family dog that we’d not previously considered – to check whether water holes are safe for swimming before your children do. Most of the stories were not for the squeamish. But yes, crocodiles do indeed eat dogs – regularly it seems. Does that make crocodiles evil? They certainly have a look to them that might make you think so, but another of the demonstrations at the farm was very educational. A zookeeper (dressed in typical Steve Irwin style, khakis and shorts under an Akubra) showed just how small a pool a crocodile needs. Standing next to what looked like a dirty shallow garden pond, the keeper took a long pole and attached the carcass of a chicken to the end. Holding it over the muddy, empty pool, he allowed it to briefly touch the orange surface. Instantly, a gigantic crocodile appeared from nowhere. With a single, lightning-fast move, it took the chicken in its ample jaws and rolled with it in the water before disappearing under the surface again. After gasps of shock, the audience stood in nervous silence, grateful for the fence between them and the pool and wondering how the keeper could stand so close. 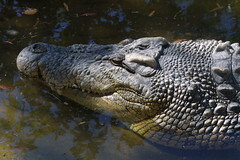 Who would have thought such a tiny pool could hold two metres of hungry crocodile? It was easy to see what had happened to all those dogs. After the demonstration, the keeper took questions from the audience, standing on the bank near the crocodile and giving the impression of a lazy familiarity with it. One question asked how long he’d been doing the job and how well he knew the crocodiles. He replied he’d been giving this demonstration four times a day for over a decade. He said he had a good understanding of how the crocodile thought; mechanically. He was under no illusion that he had a relationship with it. Each time it took the chicken was a single instance of predation. He was sure that any time he got too close, it would grab and roll with him rather than the chicken. So he didn’t; that lazy familiarity was actually a carefully observed respect, established through training and years of experience. He advised to never, ever believe that a crocodile was a friend. Crocodiles are not evil; neither are they good. They are just reptiles, dealing with their hunger. To call something “a reptile” is not a value judgement; quite the opposite since reptiles are demonstrably amoral and mechanistic. Millennia of evolution have developed in them the speed and skills to sate their hunger, and they act and react out of reptilian instinct. Despite their evil looks and repellant behaviour, they are just being reptiles, doing what reptiles do. Working with them is not a matter of relying on their goodwill. It’s all down to understanding their instincts – and learning to stand in the right place. And that’s what I mean when I say a corporation is just a reptile. Only the presence of good, principled people can make them act against their instincts.